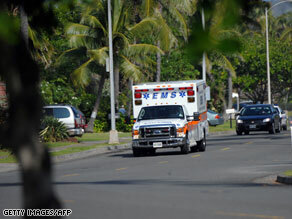 An ambulance leaves the neighborhood where President Obama and his family are vacationing in Hawaii. HONOLULU, Hawaii (CNN) - The child of one of President Barack Obama's golf partners suffered a cut chin during the president's Hawaiian vacation Monday, prompting a stir when Obama quickly left the course so his partner could attend to the child. The president and his entourage quickly left the Luana Hills golf course outside Honolulu and an ambulance was called to the vacation home the first family has rented on the north side of Oahu. A White House aide told CNN that the child who was hurt was treated on the scene, but could go to a hospital later as a precaution. Neither Obama's golf partner nor the child were identified. Aides said no member of the first family was hurt in the incident, details of which were not immediately available. The president later returned to the course. - CNN Senior White House Correspondent Ed Henry contributed to this report. Who was hurt and how? THAT would be news CNN. In any case, I hope the child is OK.
"This president has had the toughest job of all presidents" . . . This is news? Good god. Not only is this irrelevant and boring, it violates the privacy of those involved. CNN, ask yourself this: WHAT WOULD WALTER CRONKITE DO? Whilst this President lounges in Hawaii, his loyal drones, Queen Nan and Dingy Harry, are hard at it making the repugnant "health care" bill even more ridiculous! What is the most disrurbing thing about this bill is that it's a bogus $2.5 TRILLION window dressing so this President can brag that he passed a "historic" health care bill...now that is arrogance we can believe in! Must be nice to take a vacation when people are hungry, unemployed, and losing their homes.. The President is just as entitled to a vacation as the rest of us and you can believe a/ he won't be taking as many vacation days as Pres. Bush did b/ he's doing a great deal of work and for him it's a working vacation. He's available 24 hours a day and gets interrupted with a lot of information and has many decisions to make so...it's not really a vacation but rather a chance to play golf for a few hours in between working in nice surroundings. I could only hope that the Pres rushed in the same urgent manner to attend our national security matters in order to protect America from terrosits' attack. The problem for him is that he does not believe in the war on terror and does not see the urgency in reacting to the failed terrorist' attack on the Northwest flight to Detroit. It is very nice for him to play golf while he and democrupts attacked President Bush all the time during last 8 years. Well, sounds like a normal family on vacation. Except that when someone gets hurt it is not breaking news. So stop whinning about President Obama’s vacation time, he is no where near Bush’s record yet or even Ronald Reagan’s. So give it a rest. Happy New Year America and President Obama, Family and Friends. WOW!!! Huge story, this could be bigger than the corruption under his administration. Did OB offer to pay for his health premiums forever, or is he already from Nebraska? What a waste of health care money! Calling an ambulance for a cut chin? No wonder why health care is so expensive! Use a bandaid! Why would the President hastily leave, only to return to the course later? He could've and should've stayed for support. Surely the Secret Service can keep the President secure during unforseen events... It just seems weird that he would leave. I hope everyone is okay. This should be front page news keep the rock star status going. You would think our press would have more pressing news, but given the rock star status I guess not. Do you have any jobs like yours we can have. Enjoy your vacation while our Country go down the tube. Sound like two father's that not only love there kids, but care a lot. Now Obama will give a speech stating that he is against child injury. Quote "VACATION? GOLF? Are there not more pressing things that we are in the midst of: TERRORIST ATTACK, HIGH UNEMPLOYMENT???" It's Christmas for crying out loud, sure there are tons of people around the nation plus the world who would die for the lives some people have. BUT not everything can be accomplished in one single day, most of the work that Obama is doing is also being handled by several other people, you can't blame the man for having a break from doing his job. Would you like to be pestered for vacationing when people demand work out of you? An ambulance for a cut chin? Oh my God, no wonder health care costs in this country are never going to come under control. Probably use the ER for a toothache as well. Honestly, thats terrible but why is this news? its not like it was a member of the Obama family. You news people need to get some new material. Is this really any of our business? What is this crap? What a waste of news space. Also, why isn't this guy doing work? The left constantly complained that Bush was always on vacation and no one is calling Obama out on doing the same. I don't think either of them were/are right in doing so, but those on the left need to hold their guy accountable too. OMG!! I hop ehe didn't have to use this dreadful healthcare plan we currently have. I just wasted two minutes of my life reading this article. Excuse me while I tend to my brother's wife's co-worker's cousin's friend who needs a Band-Aid for a papercut.